Every so often life gives us milestones where we naturally step back and wonder in excitement of what the future holds. We reflect on what brought us to that moment and what experiences will propel us forward into the next season of life. As a photographer, I get to mark those moments and preserve them for posterity. I get to show the future how you were, who you were, in this moment! THAT is why I love making lifestyle portraits. I don't know a stranger, I'm not afraid of flopping a joke, I talk too much, and laugh too loud. BUT if you are the kind of person who rolls with the punches and isn't afraid to laugh with me, we'll make some beautiful, joyful pictures! CWP shoots are fun and relaxed. Posing is directional, so that you never feel stiff or look unnatural. The whole point is to have a good time and make some gorgeous images! "Claire made sure I felt comfortable during my shoot and gave me lots of options. Her posing direction was so helpful and I absolutely loved how the pictures turned out! One of my favorite things was seeing how some of the more silly poses turned out to be great pictures!" 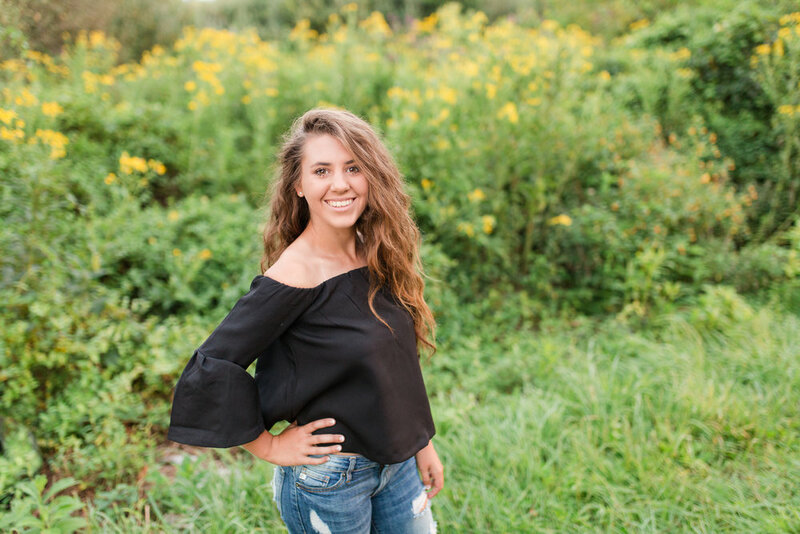 While we can probably squeeze you in your senior year, it's ideal to shoot your senior session your junior year or the summer in between so you'll have plenty of time to use your photos! CWP tends to book a few months in advance with summer and fall sessions getting snapped up the quickest. If you have your heart set on a particular season, it's best to get on the calendar as soon as possible. CWP shoots nearly all sessions during "golden hour" which begins about two hours before sunset. Accordingly, we set the start time after choosing the date and location of your senior session. Summer and early fall sessions are primarily scheduled on weekdays because our weekends are reserved for weddings. Fortunately, the summer sun often lets us begin our sessions at 6pm or later! Hooray for those long summer days! Late fall and winter sessions are usually scheduled for the weekends because the sunsets so much earlier in the evening. I use what I call "directional posing," which means I give you active, moving poses and keep the flow going. The main thing is just that we don't get too serious! We aim for a relaxed environment and natural poses that show off your natural beauty and personality! We'll choose your shoot location together. If there's a place near and dear to your heart, I want to hear about it! If you need help picking a spot, I have lots of ideas! Optimally, we'll choose a location with some variety where we can walk around and get different looks. I don't put a limit on your outfits, but do advise that you don't change too often so we don't eat up your session time. After we book, I'll send you a few wardrobe tips for choosing outfits that photograph well and avoiding certain patterns and colors that look weird on camera. How much time we have together will depend upon which package is booked, but with every single session, my number one goal is for you to have a relaxed experience where we capture some beautiful, natural pictures! I've been in your shoes, and I know it's frustrating to navigate complex pricing or watch out for hidden fees. Wouldn't it be great if every photography package included the freedom to download your images, without watermarks, share them on social media, and print wherever you like? I think so too. My goal is to make the whole senior photography experience FUN and EASY. That's why all senior packages include digital delivery of your online gallery where you can download, share, and print to your heart's content. No purchase minimums, no watermarks, no secrets. Packages start at $300. For more details, drop me a line below and you'll receive a detailed pricing guide to walk you through all the options! Once you've decided you'd like to schedule a senior session, reach out via the contact form below. I want to hear about any location ideas, your favorite seasons, and anything else you want to tell me! Within 24 hours I'll send you a detailed pricing guide and what dates are available. Then you'll receive a proposal, contract, and invoice to make things official! Scroll through our seniors' frequently asked questions. If you still have questions, drop me a line! My style is interactive and my posing is directional. That means that I’ll give you guidance on where to stand and what to do- but it will all be natural and fun. There’s always a lot of talking, joking, and movement- because it would be weird and boring if we just stared at each other the whole session! I might have you do some weird things to mix things up or get you laughing, but it’ll look great (and still natural) on film! I don’t move you around like a Barbie doll or put you into unflattering or unnatural poses. It’s just not my jam. Should I come up with a list or Pinterest board of specific pictures? If there’s a particular pose or shot you have your heart set on, sure thing. Otherwise, I typically advise against specific shot lists. I’m known for capturing seniors in an authentic, joyful way. I can't accomplish those hallmarks if we are focused on a long list where we are trying to copy what some other photographer did. On the flipside, if there’s a specific place you want to capture- absolutely tell me about that! I had a senior once that wanted to go back to her childhood home place and take pictures on her old tire swing. They turned out awesome because it was just so personal and real! I’m interested in photography too. What kind of gear do you use? I shoot with a Canon Mark III and 6D with an arsenal of lenses that I choose for specific purposes. I prefer prime lenses for their sharpness, gorgeous bokeh, and capacity for shooting natural light in the most beautiful way. 95% of the time I don’t use artificial lighting for senior portraits because I prefer the soft glow of a sunset or daybreak, but occasionally will break out the flash for a creative exposure, like freezing splashes of water behind a swimmer! But remember, all of these items are just tools and only as useful as the photographer holding them! If you want recommendations on how to up your photography game, ask me during your shoot! I love talking shop! The first step is to reach out via the contact form above. Once we have had a chance to chat a bit and I have answered any lingering questions, I'll send over a proposal that will walk you through all our CWP package options. Once you’re ready, you (or your parent if you’re under 18) can sign the contract online and pay your fee online. (No need to print, scan, or mail!) Then you’ll officially be on my calendar! If you need a payment plan, just ask. We can do a non-refundable deposit to secure your date with the rest being due 3 weeks before your session. Otherwise we do the whole amount at the signing of the contract for the sake of simplicity. What’s the difference between booking a package with print credits and just purchasing the prints later? The higher end packages have print discounts built into them, but you can certainly wait to purchase items later without the discount. It’s whatever is easiest for you! Will you travel for my senior session? Absolutely! I love shooting in new places any chance I get! 25 miles of complimentary travel (round trip from Martinsburg, WV) come with each session. Additional travel is billed at 90 cents per mile. Can we travel from location to location during my senior session? Yup! There is no fee for travel between locations, but coverage is continuous so a long journey after we begin shooting cuts into our photography time. You and I will look at the map and envision the shoot together before the big day to make sure we get those must-have locations while still considering our time restrains. If the forecast is confidently calling for rain during your session, we will just reschedule the session. If it's a local shoot and the forecast is iffy, we may wait until that day to decide. If we are planning to travel, we'll likely call it 48 hours before the session. 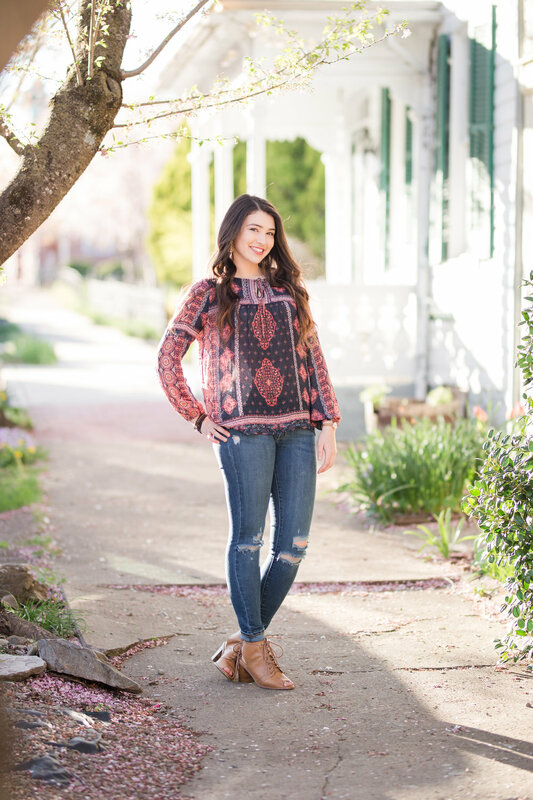 How long does a senior session last? How many outfit changes do I get? This depends on which package you book. Our most basic package is 30 minutes, so I would recommend one outfit change maximum because we’ll be eating into our session time. The largest package, on the other hand is 2 hours, giving us ample time for location and outfit changes. What time of day should I schedule my session? Photographers get all giddy about "Golden Hour." It's when the sun is low in the sky and the light is super soft and flattering. We usually get two a day if the weather is cooperating and it begins about 90 minutes before sunset or right as the sun rises. When scheduling portraits, photographers take into account the location and season, whether there are mountains or building blocking the sun, etc. etc. So first you’ll choose your date and location and then I’ll set the start time. Senior Galleries and your featured blog post will go up within 6 weeks of your shoot! This will depend on which package you choose how many outfit or location changes we have, etc. Each package has a minimum amount of images that will be delivered so you’ll know exactly what to expect in every step of the experience. I love delivering images digitally because our digital galleries make clients' lives so much easier! You can order prints, canvases, and other products from my professional lab directly through your gallery! You just click on the image, add the product and size you want to your cart, checkout, and voila! In about two weeks your professionally calibrated and printed photos will be delivered straight to your door! No need to download, upload, or resize! Further, you don't have to play middleman taking orders from other family members. You can just give them the link and they can place their own orders and download all the images too! Your photos are yours to have and to hold, and that includes a printing release. That’s what I would want as a customer, so that’s what you get too! You’re absolutely welcome to download your images and have them printed at the location of your choice. Just keep in mind, if you choose to print somewhere else, I can't help you troubleshoot or ensure perfect print quality. I like the idea of having an album from my session. What are my options? Do I choose which images are used in my album? You can let me know which images were your favorites and what you'd really love to have included in the album by making a favorites list in the gallery. (You just click the little heart icon on each favorite image.) You needn't choose each and every image for the album if you don't want. You can just give me a head's up which ones are the must haves. Alternatively, if you want to let me take the reins and design a good mix of images, I'm happy to do that too. I know life is busy! Do you offer senior announcements? Yes! My favorites are our foil embossed announcements because you can’t find them anywhere else! We also design customized graduation announcements, party invitations, and thank you cards for CWP Seniors alone. I’m totally in love with our coordinating stationary suites! Note: We do not accept design or print work for non-CWP seniors- sorry! Your photos will be available to download and open for print orders for 3 weeks. So be sure to download, save, and backup your images to multiple places before then. Your gallery email will remind you of this timeline. Can I get ALL the images from my shoot? No, but trust me, you do not want them all! A huge part of the overall experience is culling. That means I take the time to sort through all the images and pick the best pictures that tell your story. It would be completely overwhelming to see all the test shots, duplicates, eye blinks, etc. One of the reasons “shoot and burn” photographers are so cheap is because they skip this step, just giving you every unedited, unculled photograph. If you’re investing in a real photographer, you shouldn’t have to sort through all of the images that should have been left on the cutting room floor. How should I credit you as my photographer on social media?